Good Day to all of you, and I hope you are enjoying a nice relaxing Sunday. However, some people are not fond of Sundays, because there is not a lot to do, but there are a lot of great museums that can offer a family a lot of fun. 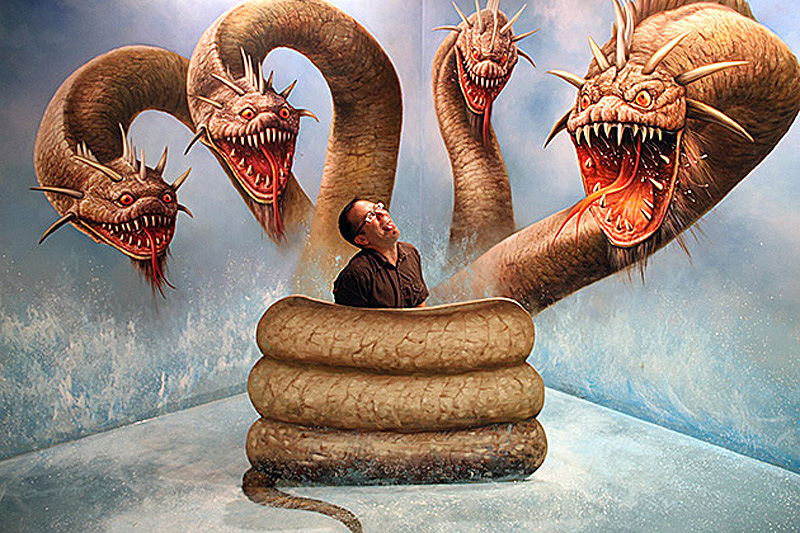 Today’s optical illusion is all about fun, and the above picture shows a guy who looks like he is in a lot of trouble because he is about to be eaten by three giant snake monsters that have their coals wrapped around him. However, before any of you get upset, you may notice that this poor man is not in as much trouble as you think. Speaking of something looking like something else, take a look at this picture of zebras. Lions and zebras are natural predators, and this optical illusion shows a group of zebras, but there is a predator right in the middle of the herd. Do you all see that the zebras standing together are forming an image of their biggest nemesis? If you all see the lion in the middle, be sure you leave a comment below to let us know what you think about this amazing trick of the eyes! Have a good weekend!